Derived from the Latin word ‘mala’ which means cheekbone, Malar rash is a kind of skin condition characterized by the appearance of rashes on the face. It is usually flat in nature and red or purple in color and mostly occurs on the bridge of the nose and cheeks. Due to its appearance in the shape of a butterfly, Malar rash is also known as Butterfly rash. One may also call it malar butterfly rash. Malar or butterfly rash on face is usually reddish or purplish in nature and may lead to the development of flaky scales. It is also macular in shape with edges which are sharp. Brought to light by Dr. Ferdinand von Hebra from Vienna in the 1840’s, malar rash is mostly associated with those suffering from Lupus erythematosus and in such case is known as lupus malar rash. But it certainly has other causes as well. It is believed to affect a significant percent of population all over the world. The symptoms of malar or butterfly rash may be both mild and severe in nature depending on the extent to which the face has been affected and also the extent to which the face is exposed to sun rays. In case of mild malar rash, the rashes acquire a blush-like nature whereas, in severe malar rash, one may notice the formation of scales on the affected areas of the face. However, in both the cases, the rashes may either be raised or may be flattened. Those suffering from malar or butterfly rash lupus disorder may find the rashes to occur across the cheek and also on the bridge of the nose. Moreover, it has been noticed that a person suffering from malar rash also suffers from fatigue, the reason of which has still not been discovered. Lupus butterfly rash specifically causes pain and the swelling or stiffness of the joints due to its harmful effects on the connective tissue of the skin. Butterfly rash of lupus may also be signaled by the inflammation of the glands and the infection of the kidneys and the urinary tract. Such pain usually increases the body temperature. Severe malar rash may be detected by various kinds of neurological disorders such as convulsion & confusion, seizures and other problems related to the CNS. But one fact to notice is that one does not experience itching in case of malar rash and that the condition can be both transient and progressive in nature. One may experience a burning sensation at times and in specific cases. However, Malar rash may just not be of a single kind affecting the face only but may also affect other parts of the body in a more or less similar fashion. Malar or butterfly rash on forehead, neck and the chest are some of its other types. It usually lasts for a week but may last for a month in severe cases and leave a permanent mark on the skin even after being completely treated. Systemic Lupus Erythematosus (SLE): SLE is a chronic autoimmune disease that causes a natural attack on the cells, tissues and organs of the body. The attack may actually render the organs dysfunctional and cause their ultimate damage. It is most likely to attack the brain, heart, lungs, liver, kidneys, blood vessels, several joints, the overall nervous system and the tissues and the skin. SLE is basically triggered either due to the exposure to environmental pollutants , due to exposure to the harmful ultraviolet rays of the sun, side effects of drug intake, or due to reasons which may be associated to one’s genetics. It is also responsible for causing red butterfly rash on face. Both young men and women in their age group of 15 years to 50 years are affected by this disease. But it has been observed to affect mostly women than men and thereby cause lupus malar or butterfly rash. 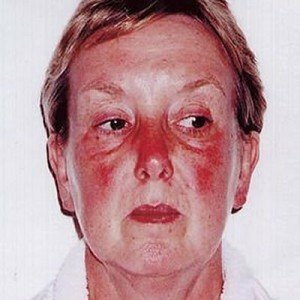 Rosacea: Another chronic condition that affects the skin is Rosacea that is characterized by the swelling of the face and its reddening. The person may suffer from the development of pimples on the cheeks which may be filled with pus in some cases. 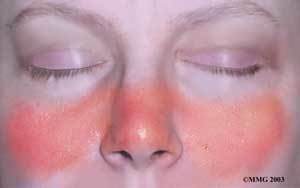 Such a condition is responsible for causing malar rash rosacea. 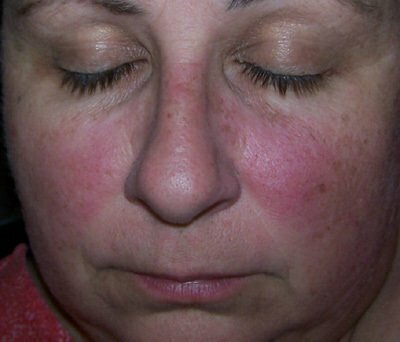 Prominence of the blood vessels belonging to the face is a highly noticeable feature of rosacea. Bloom Syndrome: This is a kind of syndrome that causes abnormalities in the pattern of chromosomal arrangement in a person. One of its effects in the development of rashes on the epidermis including butterfly or malar rash. Lyme disease: This disease is mostly caused by the ticks of mice which leads to the bacterial agent, named Borrelua burgdorferi affect the eyes, heart, the nervous system, the musculoskeletal system and the skin. One of the affect on the skin is manifested in the form of malar or butterfly rash. Erysipelas: Another bacterial agent named Streptococcal is responsible for causing acute inflammation of the skin causing red and painful lupus malar rashes. Seborrhea or Seborrheic Dermatitis: It is a chronic skin disease that just not causes the scaling of the skin and dandruff formation in the hair but also leads to the development of rashes on the skin and scalp, including malar rashes on the face, chest and neck. Dermatomyositis: it is a connective tissue disorder that causes skin and muscular inflammation and is one of the root causes behind malar or butterfly rash. Overexposure to harmful rays of the sun also causes butterfly or malar rash, especially to those whose skin are quite very sensitive to sunlight. The most common way of diagnosis of malar rash is to undergo blood tests, urine tests, and biopsy of the kidneys. Such examinations help the doctors to get a fair idea of the general factors causing malar rash and also aids the acquisition of the knowledge of the patient’s medical history. Besides these, advanced and specific medical tests such as X-ray of the face, neck or chest, C-reaction protein test, anti-nuclear antibody test, ANA, Erythrocyte Sedimentation Rate test help in the specific detection of the cause of butterfly rash. However, malar rash differential diagnosis is required to specifically understand its causes since many of its symptoms are quite similar to the ones that are seen in case of psoriasis and diabetes of both types. Check out these pictures to understand the condition better. Sunscreen lotions: For those whose skin is too very sensitive to the rays of the sun and are on the treatment for malar rash must apply UVA and UVB sunscreen lotions with SPF of not less than 30 in order to be protected from the harmful UV rays. Steroidal creams: Application of steroidal creams prescribed by the doctor helps in reducing the inflammation involved in case of malar rash and may even provide relief from itch if it at all occurs, which is very rare. Drugs: Non-steroidal drugs which are both anti-malarial and anti-inflammatory in nature are prescribed to treat lupus malar or butterfly rash. Moreover, disease modifying anti-rheumatic drugs (DMARDs) and Immunosuppressive drugs are recommended for severe malar rash. They help in treating the disease well and also prevent the recurrence of the disease. Along with sunlight, exposure to pesticides, mercury and silica must also be avoided since their contact aggravates the disease. Besides these medications, one can also treat malar rash at home by applying vitamin E oil, olive oil, cod oil, and even a pinch of baking soda on the affected area since it reduces the irritation and pain involved. One may take a bath using oatmeal ingredients in warm water and may also apply fresh Aloe Vera gel on the affected area so to allow the fast and effective healing of the butterfly rash. Besides these, a low fat, vegetarian diet, sufficient amount of sleep and drinking plenty of water help in the effective healing of the butterfly rash. Therefore, one take necessary steps under the guidance of a dermatologist since it is risky to avail medicines over the counter for treating malar rash since they may aggravate the skin condition instead of healing the rashes and cause great distress both physically and socially. After years of stragne butterfly type rash, hospital stays, joint, leg and back pain along with other symptoms out little girl age 8 may finally get to see a specialist about what has been ailing her for years. Each flare up and outbreak she gets sicker. We are hoping it is not lupus even after having a pos ANA test which was really high and a high Sed rate as well. She has been tested by Dermatologists and allergists and they can find nothing. We are waiting on a call from Childrens hospital from a Rhuematologist. i have butterfly rash since 2001 and it is right that if we use sun blocker to keep it in control but would some one tell me how it can be treated comletely that it does not appear again in a patient. I am glad I found this article. I have been using pure Vitamin E oil every night and it is working and Im so happy. I’m also using hydrulonic acid which is helping as well.